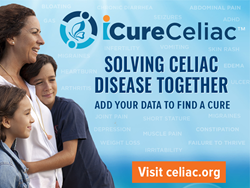 Celiac Disease Foundation launches iCureCeliac™, a patient-powered research network (PPRN), for people living with celiac disease and gluten sensitivity to help facilitate new treatments and a cure. In keeping with our mission to advance research by leveraging technology, Celiac Disease Foundation (CDF) is pleased to announce the February launch of iCureCeliac™, a patient-powered research network (PPRN). At iCureCeliac™, people living with celiac disease and gluten sensitivity can help facilitate new treatments and a cure by safely and securely contributing their health information online. Data collected through iCureCeliac™ will be made available to the FDA and the research community. Watch the iCureCeliac video here. By aggregating data from the profiles of thousands of people with celiac disease and other gluten-related disorders, iCureCeliac™ will provide much-needed insight into how celiac disease and gluten sensitivity impacts those affected. Patient registries for other chronic diseases have been credited with improving treatment by as much as 50% through helping researchers and clinicians discover critical patterns in treatments and outcomes. iCureCeliac™ is an initiative of the Community Engaged Network for All (CENA), a Patient Centered Outcomes Research Institute (PCORI)-funded project, led by the Genetic Alliance, of which CDF is a member. iCureCeliac™ was developed in collaboration with the University of California, San Francisco (UCSF), the University of California, Davis (UCD), the University of California, Los Angeles (UCLA), the CDF Medical Advisory Board and scientific and medical communities, Private Access, and ten other disease advocacy organizations that were selected by Genetic Alliance from more than 100 applicants. The power to shape new treatments and a cure comes from all of us sharing our experiences. The success of iCureCeliac™ relies on the contributions of our entire community. Watch the iCureCeliac video here. Data and insights contributed by iCureCeliac™ participants under informed consent are available to researchers investigating topics important to people with celiac disease. Research topics can include treatments and outcomes, lifestyle and activities, quality of life, healthcare, biomarkers of celiac disease, and many others. For more information, contact icureceliac(at)celiac(dot)org. Celiac disease is a genetic autoimmune disorder in which the ingestion of gluten, a protein found in wheat, rye and barley, leads to serious damage in the small intestine. It is estimated to affect 1 in 100 people worldwide. Two and one-half million Americans are undiagnosed and are at risk for long-term health complications. Currently, the only treatment for celiac disease is lifelong adherence to a strict gluten-free diet. Celiac Disease Foundation (CDF) was established as a 501(c)(3) non-profit organization in 1990 to improve the quality of life for all individuals impacted by celiac disease and other gluten-related disorders. Affecting 1% of the world’s population and with a prevalence doubling every 15 years, celiac disease is both a serious genetic autoimmune disorder and a growing public health challenge. Despite a simple blood screening test, only one in six celiac disease sufferers is diagnosed, leaving millions at risk for long-term health complications including Type 1 diabetes, thyroid, liver and heart disease, and intestinal cancers. CDF leads the fight to increase the rate of diagnosis, to improve treatments, and to find a cure. Learn more about Celiac Disease Foundation at celiac.org.